A controversy has erupted over how Adarsh Co-operative Housing Society, originally meant to be a six-storey structure to house Kargil war heroes and widows, got converted into a 31-storey tower through collusion of bureaucrats, politicians and top defense officers. In 2010, the Indian media brought to public the alleged violations of rules at various phases of construction in the Adarsh Society. Questions were raised on the manner in which apartments in the building were allocated to bureaucrats, politicians and army personnel who had nothing to do with Kargil War and the way in which clearances were obtained for the construction of the building of the Adarsh Society. The Adarsh society high-rise was constructed in the Colaba locality of Mumbai, which is considered a sensitive coastal area by the Indian Defence forces and houses various Indian Defense establishments. The society is also alleged to have violated the Indian environment ministry rules. Activists like Medha Patkar had been trying to uncover the problems since at least 2004. It had led to resignation of the then Chief Minister, Ashok Chavan. Several inquiries have been ordered by the army and the Government to probe into the irregularities. 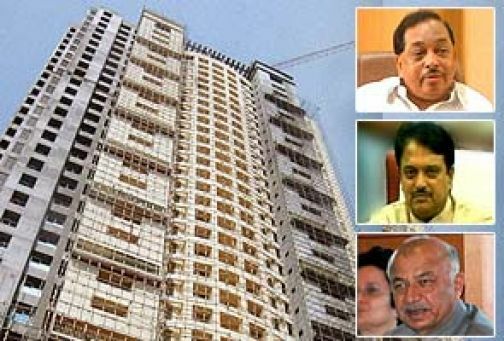 Some of the current occupants of the flats in the Adarsh co-operative society building have offered to vacate their flats at the earliest, denying allegations that they were alloted flats because they influenced or helped, in some manner, the construction of the society by violating the rules.